Gripping, shocking and a bloody good watch! 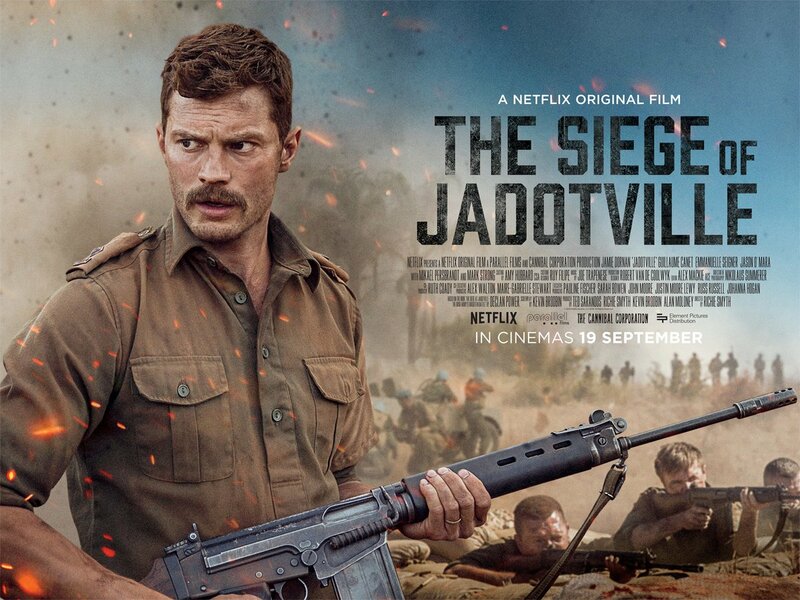 Irish Commandant Pat Quinlan (Jamie Dornan – Fifty Shades of Grey) leads a stand off with troops against French and Belgian Mercenaries in the Congo during the early 1960s. How did this not get a better release? Well, at least this movie established one thing. Netflix are funding the right scripts. Any one can film a true life event BUT that doesn’t mean that it’s going to be any good. Come on, we have the True Movies channel that says otherwise. There’s some real gems on there. I was recommended this little war flick after my family were bored one evening and “borrowed” my Amazon Fire Stick. I’m glad they brought it to my attention. It got straight to business throwing us right into the befuddling chaos with the Congo in dispute and heavy pressure from the USSR and USA forcing the UN to intervene. UN ‘peacekeepers’ choosing Ireland as a neutral force to provide security to a dilapidated compound. Open for attack with only two exit points. The first 30 minutes was slow burning BUT intriguing. We followed the backhanded deals between the UN Secretary General (Mikael Persbrandt) and Conor Cruise O’Brien (Mark Strong fetching a very bad wig). The hypocrisy as the officials passed the buck. Ordering the clueless troops to protect important vantage points in a feeble bid to stop the ruthless and calculated Moise Tshombe (Danny Sapani). It was good to see Sapani (Penny Dreadful) get a meatier role as the slimy general playing the officials off against each other. Jamie Dornan was superb. At first, I wasn’t sure that his performance would be strong enough for the character BUT it worked. A clever academic that can quote Rommel and Caesar with the drop of a hat BUT has never fought in a battle before. The troops just as unconvinced with their commandant as the audience. I loved how SoJ didn’t mess about with the cliched build up that has tragically become the norm in war films of late. We didn’t need a back story for every character. We cared for them and the situation that they had unwittingly stumbled upon. Soldiers merely following orders. Outmanned, outgunned and out of time. I still couldn’t believe that this was a true story as the troops discovered their limited supplies, shoddy equipment and lack of coverage. The tension as Quinlan encountered the French legionnaires in a rundown bar. Nail biting. Guillame Canet (Tell No One) was very good as the shady Rene Falques. A mercenary respectfully warning the Irishmen to stand down. The verbal sparring as the pair shared a glass of Cognac was brilliant. Kevin Brodbin’s dialogue was fantastic; “Not many Frenchmen like German tacticians. It only took them two weeks to take over your entire country”. 150 vs. 15,000. It was a 13 Hours: Secret Soldiers of Benghazi set up without the agonizing pace. The odds growing against them as they endured wave after devastating wave. Emmanuelle Seigner (The Diving Bell and The Butterfly) was wasted in her role as Madame LaFontagne. Her character nothing more than a plot device. Confirming Quinlan’s suspicions that Jadotville was a vital mining area for minerals and uranium. The action was frantic, fast paced and enthralling. I was hooked. The CGI and effects were pretty impressive for a limited budget. “What’s it like getting shot? I wouldn’t recommend it”. I didn’t expect the humour as the lads tried to make sense of it all. Fantastic. The only thing I could mark the film down for was that there were only several faces other than Dornan and the equally brilliant Jason O’Mara (Agents of S.H.I.E.L.D) that we actually stuck with. The rest were lost in the chaos. BUT I was completely caught up in this. I wasn’t fidgeting or messing about on my phone. I was rooting for them from the get go. I was even yelling at the legionnaires as they cheated at every obstacle. Faking a ceasefire to pick up the wounded and launch mortar attacks! Mark Strong was excellent as O’Brien. Sitting on the sidelines and churning out all sorts of rubbish to Quinlan in desperation as the plan failed. Telling him to hold his ground. Despicable. The finale was unbelievable and emotional as our heroes returned to an empty airfield. No one to welcome them home. Branded cowards in a battle they should never have had to fight. It took 40 years for the ‘A’ Company to receive their medals of honour. Shocking. The credits and figures really hit home. I cannot praise this film enough. Worthy of your time. This might even creep into my top war films list. If you haven’t got Netflix, get it, steal it and watch this. If you have, why aren’t you watching it?